Upright deep golden clear cluster with a rare bent-and-curved crystal holds casts after pyrite, and very uncommon thus, it rises from a white regrown [self-healed] base with no matrix. Several crystals have dark iron oxide dendritic overlays sealed in with drusy quartz, and when you turn the cluster to right of front you'll see deep rainbows. 2-1/4x 2-3/4x 1-1/2" high, large miniature, the largest point is 1/2x 1-3/4" tall. 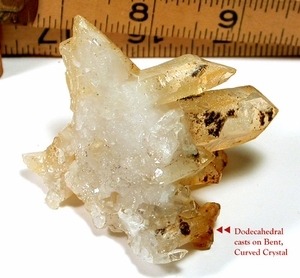 No damage: one crystal's conchoidal facet's 'already' in regrowth. Record keepers, and those rare casts are 1/16x 3/16" dodecahedrally.